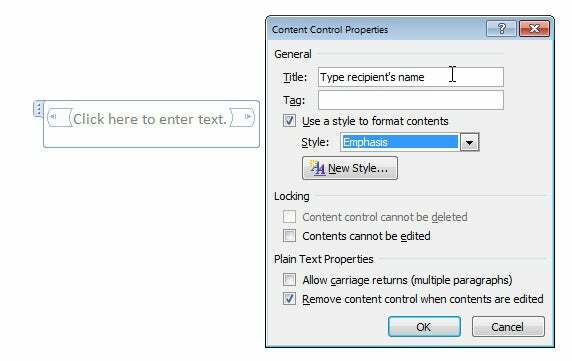 Content Controls let you add interactive elements to your Word documents, but you might not even know they exist because they're accessible only from the Developer tab in Word’s Ribbon, and that tab is disabled by default. To enable it in Word 2010, choose File > Options > Customize Ribbon. In the right-hand panel, locate and click the Developer checkbox and click OK. In Word 2007, choose File > Word Options and then click the Show Developer Tab in the Ribbon checkbox (from the Popular set of options) and click OK. Now select the Developer tab, locate the Controls group, and click Design Mode. You’re ready to set up your controls. The Date Picker Content Control will display a small calendar that allows the user to choose a date. Click the icon to add this element to your document. Turn off Design Mode, and you’ll see a box labeled 'Click here to enter a date.' The calendar will appear when you click the down arrow on the control. Pick a date, and that date will appear automatically in the document. Use the Plain Text Content Control as a placeholder for a user to enter text into the document. The Plain Text Content Control creates a designated place for someone to enter text into a document. You can preformat the text in this control using a defined style, so that any text the user enters there will appear a certain way. You can also elect to permit or disallow carriage returns. On top of that, you can leave this control as is, lock it so that it cannot be deleted, or set it so that it automatically disappears once its contents have been edited. In the last mode, the content control will appear in the document until someone has typed text in it; as soon as they do, the content control will vanish, but the text typed into it will remain. Populate the Drop-Down List Content Control with items for the user to choose from. With some documents, you’ll want to pick from a limited number of options presented in a list. 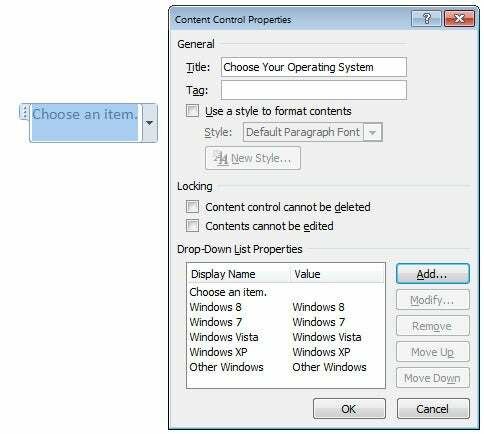 In these cases, creating a template with the Drop-Down List Content Control or the Combo Box Content Control is the way to go. When you click Design Mode and return to the document, you’ll see the words 'Choose an item' in gray. Click that text, and a drop-down box will appear with the words in your list. Click one of these items, and the word will appear in the document. You can change the symbols used in the Check Box Content Control. The Check Box Content Control allows a user to place a checkmark to indicate their selection of an item. To add one to your document, click the Check Box Content Control and then click Properties. A Check Box can toggle between two states when clicked on: selected, represented by an X inside a box, and not selected, which shows a blank space inside the box.